By keeping up with these few simple habits, your hearing aids will stay in good condition. There are a lot of things to consider when it comes to your hearing health. But did you know that there are things you can do for healthy hearing aids as well? By keeping up with these few simple habits, your hearing aids will stay in good condition. If your hearing aid didn’t come with cleaning instructions, then you should always ask your audiologist about the best cleaning method. But generally, the easiest way to clean your hearing aids is with a dry, soft cloth to rub away ear wax and dirt. If your hearing aids are the type with removable ear molds, then you can lightly wash them with mild soap. But you never want to get the actual hearing aid wet. Some ways to keep your hearing aid clean is to avoid any greasy hair products and be careful of how much sweat and earwax buildup occurs. The number one thing you should keep your hearing aids away from is moisture. Like with most electronics, excess moisture even from steam can damage your hearing aids. Additionally, you don’t want to wear hearing aids that aren’t dry because that will trap moisture in your ears which could lead to infection. If they do get wet, be sure to let your hearing aids air dry and do not use a blow dryer. Heat can damage hearing aids just as badly as moisture. Lastly, you should avoid dropping your hearing aid as much as possible. Accidents happen, of course, but you can reduce the risk of damaging them if you are careful when you put them on and remove them. For example, at night you can take them off while you sit on your bed so they will have a soft landing. Your batteries are something your hearing aids can’t function without. So, it is always good to stock up when you can. But be careful to keep your batteries safely out of reach of small children and pets, because those tiny batteries can easily become a choking hazard. 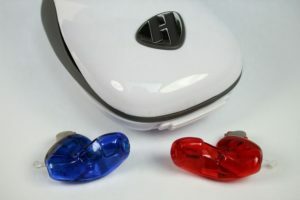 The best way to make your hearing aid battery last longer is to turn off your hearing aid when you’re not wearing. Also, make sure to replace your dead batteries right away to avoid letting them sit and potentially corrode in your hearing aid if you forget them. This entry was posted on Friday, April 5th, 2019 at 11:08 am. Both comments and pings are currently closed.